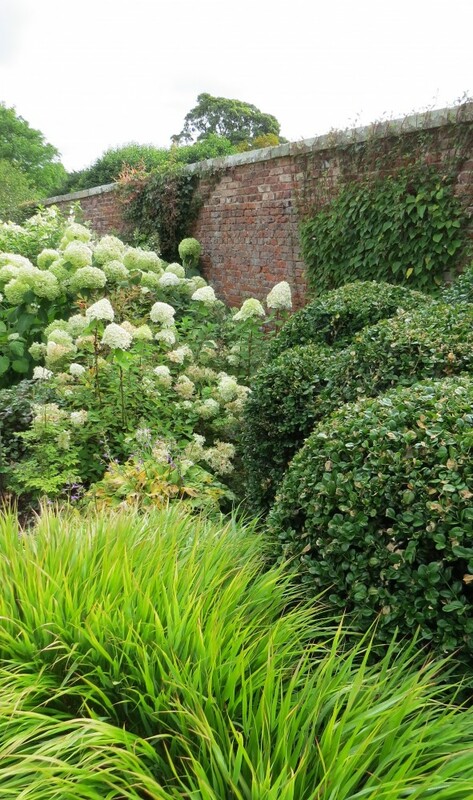 Scampston Walled Garden – A Bit of a Curate’s Egg. From time to time a new garden opens to the public that grabs the headlines, and back in 2003 Scampston Walled Garden certainly did that. It is a garden that I should have been to a long time ago, but it wasn’t until last summer that I made the pilgrimage to this slightly remote part of North Yorkshire. The stunning photographs in the media had fired my imagination, but could it really be this good? Unfortunately, like the curate’s egg it’s only good in parts. 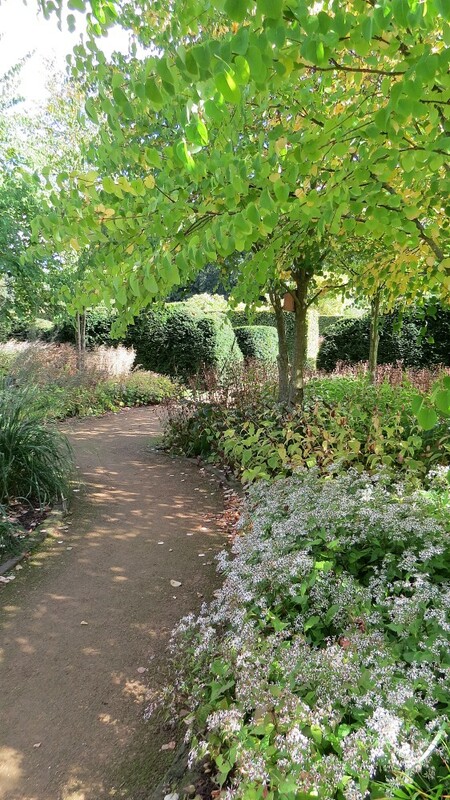 Entering the garden at one corner, the Plantsman’s Walk led around the perimeter of the garden, between a broad border backed by a high wall and a beech hedge with an avenue of lime trees. I was not expecting to see very conventional planting of shrubs, ground cover and perennials, such as hydrangeas, viburnums, paeonies and hostas. Scampston is famous for its prairie-style planting so this unphotographed part of the garden came as a surprise, but I later found out that this had been a client’s requirement. 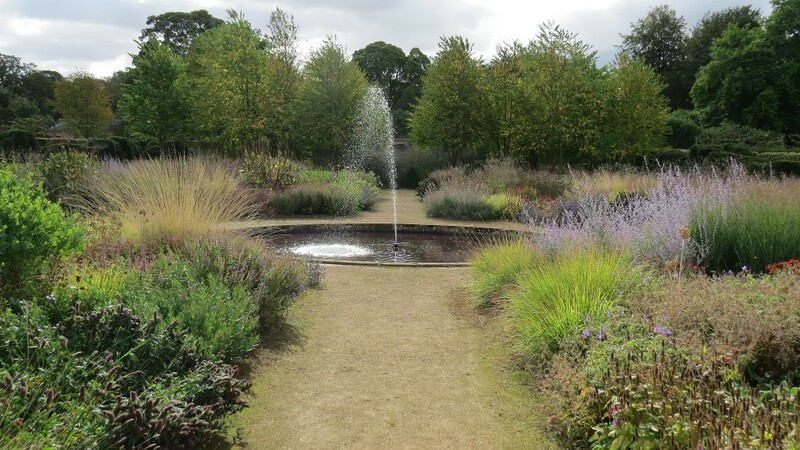 But I had not come all this way to see a conventional garden, and so I took a short cut through the Katsura Grove with its shade-loving ground cover, and found myself in the Perennial Meadow, a formal layout of four beds around a central pool and fountain (formally a dipping pond). 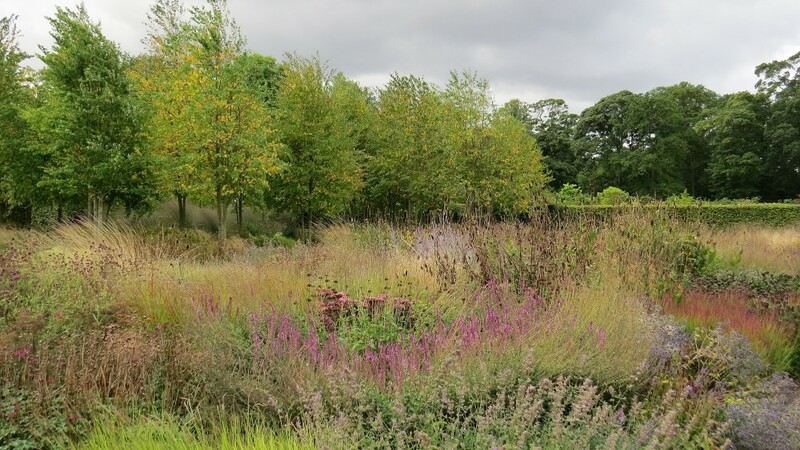 At the time of my visit, the successful and much-photographed planting of perennials and grasses (carried out by the garden designer Piet Oudolf), was probably at its best, but being a flat site I felt I could have done with a set of steps to appreciate it better. (Photographers always manage to have these on hand for those seductive shots). The Perennial Meadow is centred on the 1860s dilapidated glasshouse, which has just been awarded £750,000 from the Heritage Lottery Fund towards the cost of its restoration, and change of use to educational activities relating to the garden. 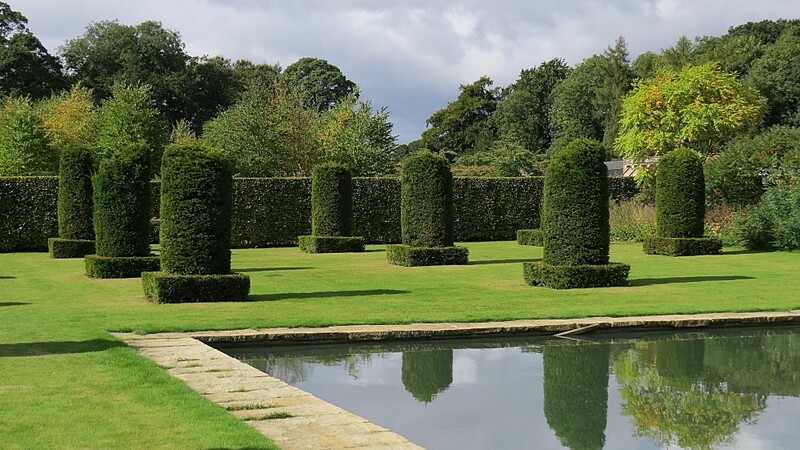 The two missing formal wings of the glasshouse will be reinstated, and these will align with Oudolf’s corridor-like Spring and Summer Box Gardens, flanked by high beech hedges. 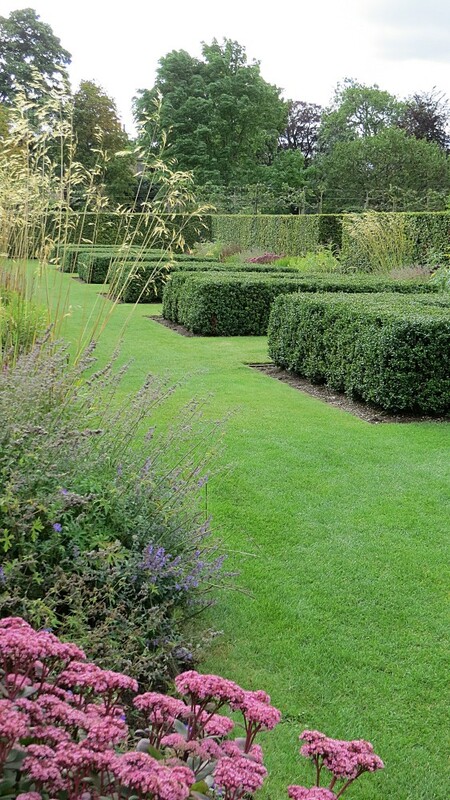 The Spring and Summer Box Gardens are garden ‘rooms’ in the traditional English Arts and Craft sense, with broad borders planted for seasonal interest, each with seven box cubes that form the central feature. I chatted to one of the gardeners who informed me that the original intention, when the box cubes had grown to size, was to set stainless steel domes and dishes into each but that this design feature had now been omitted. This seemed a pity, as it would have given the gardens a more modern coherent appearance. To the south of the Spring Box Garden lay the striking Silent Garden. The first impression was of a very stylish minimalist space, but about a few moments there was something unnerving and mournful about its grid of collared yew pillars and central square ink-black reflective pool. Like a crematorium garden, it was a space I hastily wanted to pass through. 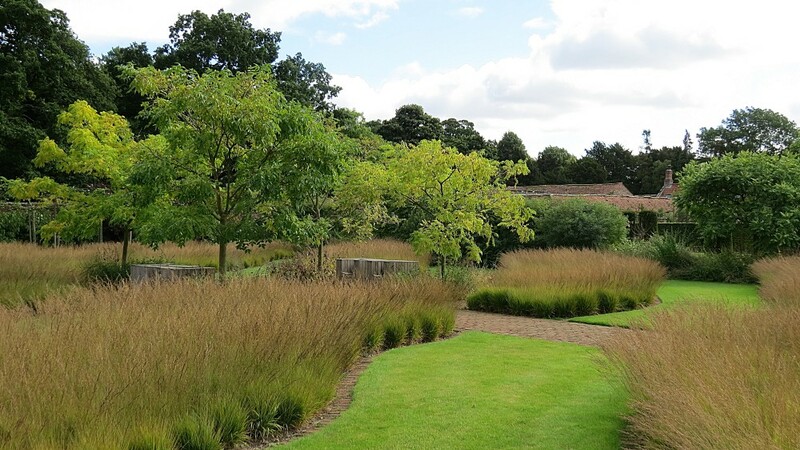 Adjacent to the Silent Garden lay the aptly-named Drifts of Grass which for me was Scampston’s most exciting and inspirational garden room. The drifts were ribbons of fine low Molinia grasses that by late summer had a purplish hue, juxtaposed with cut lawn, and with a stylish centrally-placed seating arbour. A simple and brilliantly successful piece of design, this is an idea that given the chance I intend to filch. 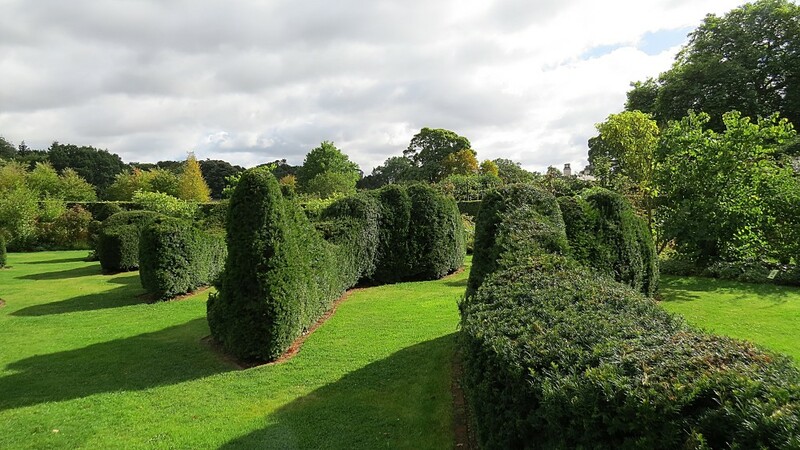 The adjacent Cut Flower Garden, with its twelve small circular box-edged beds was probably Scampston’s most disappointing garden space, with blotchy uninspired planting. I quickly backtracked past the glasshouse to Scampston’s two remaining gardens, the Serpentine Garden and the Mound both for different reasons colossal failures. The main feature of the Serpentine Garden was diagonal rollercoaster hedges of yew, but my new indiscreet gardener friend told me that too large specimens had originally been chosen to give immediate impact, and even now eleven years after planting, they have some way to go before they will form the smart sculptural design that Oudolf intended. 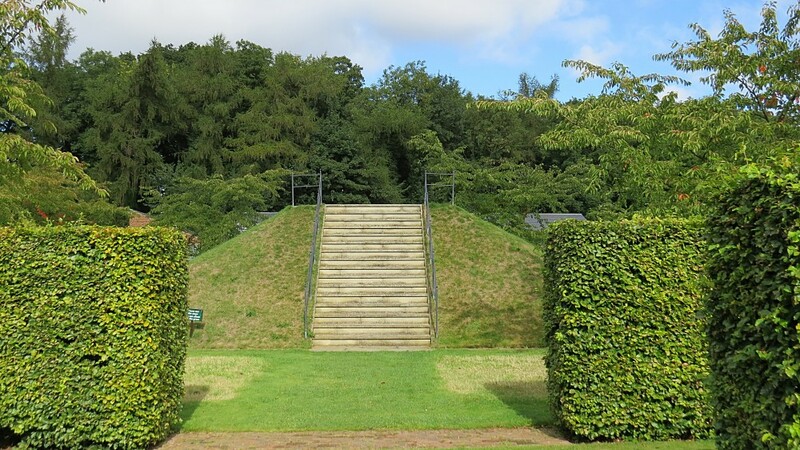 The final garden room, the Mound, a truncated Aztec-style pyramid with a formal set of steps up one side looked like a site for human sacrifice (rather inappropriately sited next to the restaurant). The intention was to be a place to overview the garden, but the surrounding formal grove of cherries has obliterated that view, and as a design feature it needed to have less obtrusive steps and crisp mown banks, the latter difficult to achieve on the light sandy soils of this part of Yorkshire. Scampston is a brave experiment, a successful crowd-puller which is its raison d’etre, and a garden that I was pleased to eventually visit. As a series of very different and disconnected modern garden rooms it is something of a ragbag of 21st century garden ideas, some successful others dismal failures. Breaking new ground it will undoubtedly inspire the next generation of gardeners and designers to further develop and refine its diverse themes.